Last week I was complaining about the too cold weather in Denver, this week is a whole different story! It's so nice to wear a skirt and tank instead of squeezing on some pants and layering up. I had my 26 week midwife appointment this week. Heard Liam's heartbeat again (160) but he was being extra shy this time. He kept trying to get away from the doppler and even kicked at it once. The midwife had a good laugh when that happened. She also told me that she wouldn't scold me because I'm so tiny but that I should watch my weight because I've already gained 20 pounds (eek!) and if I keep going at this rate I will have gained 50 pounds by the time I hit 40 weeks. Yikes. So I need to slow it down and eat more fruits and veggies and less bread and crackers. It's difficult because I'm hungry all the time! Really. All. The. Time. But I should make healthier choices. Also, I did the glucose test for gestational diabetes. Drinking the orange stuff really wasn't that bad. I finished the little bottle pretty quickly and after an hour they took my blood and I was good to go. They said they would call if the test came back abnormal. So far, no call, so I'm pretty confident that I passed. In any case, I have my next appointment in two weeks! I'm going from monthly appointments to seeing the midwife every two weeks. This pregnancy is just flying by. 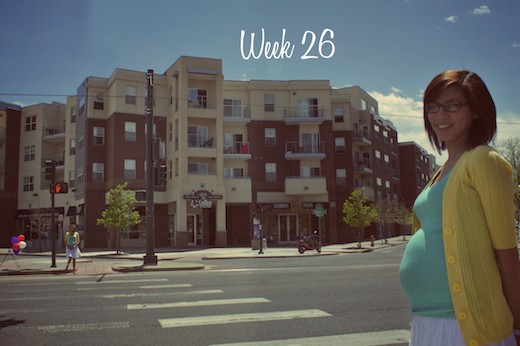 For this week's picture we headed to our favorite little coffee shop on 26th Ave, Coffee At The Point. When we first moved here we frequented this place almost everyday for the free wifi and delicious hot chocolate. Also, our church was meeting there on Sunday nights for a while before we started meeting at our current location. We really love this coffee shop. Everyone is so friendly and remembers your face and it always feels inviting. And seriously, the hot chocolate is out of this world. This morning I had a coffee date with a new friend at this place and decided to try their cold chocolate milk and it was every bit as good.